It is a common problem for B2B companies to become engrossed in their traditional outbound strategies without knowing if their efforts are even reaching their target market. They may divert their time and resources to magazine advertisements and direct mail efforts without any true metric to measure how effective their strategies are. Marketing Manager at Select International, Kristin Paxton, would advise those customers to investigate the power of B2B inbound marketing. On our second installment of the B2B Marketing Showcase, Kristin tells the story of Select International’s discovery of inbound marketing and share some of the strategy behind Select International’s marketing success since they fully embraced inbound tactics. Select International is built on two major principles that are summed up in the “Select Way.” These principles are a united workforce that always pitches in to help each other wherever they can, and superior customer service. By being committed to working together and putting the priorities of their clients above office politics, Select International has been able to build a 95% customer retention rate. Despite the high level of customer satisfaction, when it came to lead generation Kristin’s company was one of those that primarily stuck to traditional outbound techniques. When their marketing department started exploring inbound strategies a couple years ago, however, they couldn’t ignore the results. Even though the marketing side was sold on the merits of inbound tactics, it took some time and effort to bring the other company departments on board with the idea. With persistent effort from the marketing team and the power of statistics behind them, Kristin and her team were able to convince the rest of the company on the merit of inbound strategies. Although it took some time for the mindset of the company’s marketing approach to shift, they have the numbers to show that it was worth the effort. Now, inbound has changed the whole way the company does everything with their leads, prospects, and clients. As a company that serves multiple industries, it is often impractical to send the same content to all of your clients. They have different interests, a completely separate list of wants and needs from each other. Through HubSpot they have a much better system of analyzing what their customers are interested in and producing content that is directly relatable to them. The second way they segment is by where people fall in the life cycle stage. In the past, regardless of whether a company was a long-time customer or a newly discovered lead, they would all receive the same content offering. Now, using inbound practices, Kristin told us that they are able to do a much better job of meeting clients and leads where they are at. The company is now able to create a personalized response that directly speaks to what their visitors are interested, instead of just forcing the messages the company wants to tell them. This has greatly improved their process of lead nurturing. This type of approach provides much more valuable content to their clients and prospects and in the long run is much more effective than blasting everyone with the same message. Select International uses the strength of their personnel to create opinion leading content. The staff of industry leading researchers and IO psychologists who are actively out in the field with their clients on a regular basis gives them intimate knowledge of their customers pains. By capitalizing on their wealth of internal resources, they capitalize on their strengths to produce useful and knowledgeable content that resonates with their target market. With several qualified employees capable of contributing killer content, Kristin has placed a premium on incentivizing employees to write blog posts. Bringing attention to writing demonstrates the value and importance of producing blog posts and encourages the company to keep producing high quality content. There are several ways that you can incentivize your employees to write blog posts. A couple ways that Select International does this is by showing their authors the comments and feedback that their posts receive. This way they get to see directly the value their work provides to the customer. Another way they incentivize blog writing is by having contests and promotions, such as a blogger of the month award for the post with the most reads that comes with a monetary reward and the public recognition of their co-workers. These types of incentives communicate to employees that blogging is important and breeds excitement to produce great content. Kristin shared a great success story of how inbound marketing has made a big impact on the way her company interacts with customers and prospects. She’s active on Twitter and LinkedIn if you want to take a second to reach out and thank her for taking the time to share with us. If you’re interested in learning more about creating content for your organization, then check out The Ultimate Guide to Epic Content for Boring Industries. This free guide is filled with tips, tricks, and tactics that will help you build a digital marketing strategy like Kristin has done at Select International. 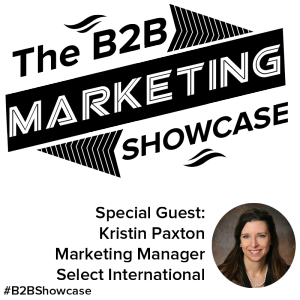 Be sure to check out our next B2B showcase to hear more great marketing advice!